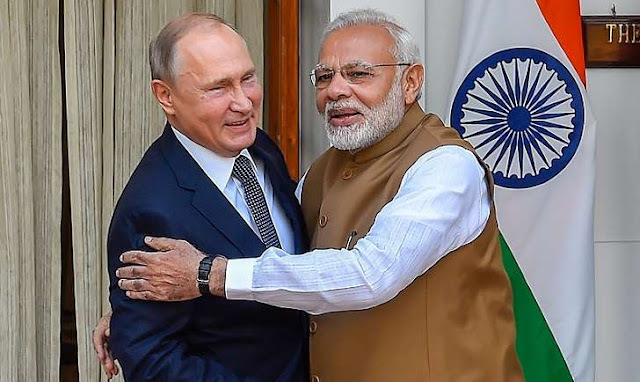 India Signs Deal For Russia S-400 Missile System And 8 Agreement: Despite the warning of US sanctions, the agreement between India and Russia of the S-400 missile defense system. Prime Minister Narendra Modi and President Putin of Russia signed the agreement on Friday. Under this, India will get a modern Triumph Missile Squadron from Russia to surface from the surface. The agreement between the two countries on assistance in space has also been signed. Under this, a monitoring station of India will be set up in Novosibirsk, Siberia, Russia. increase the cooperation between India and Russia across the wards of the past. Russia has always been together in the development journey of India. The next goal in our space is to send the Indian Astronaut to Gaganaya. Russia has assured full cooperation. The talented children of India and Russia will tell their innovative ideas. We have considered efforts to strengthen the relations between the people. I can say with confidence that friendship between India and Russia is unique. This friendship will strengthen the Putin's commitment to this relationship. We will reach new heights. These deals will be considered as a violation of Countering America's Advisers Through Sections Act (CAATSA). Under this, the US Congress (Congress) has been forbidden from purchasing arms from Russia. However, some American lawmakers have said that in this case, President Donald Trump can get special discounts. Putin said: Both the countries are connected to the unbreakable thread of friendship. India has always given preference to its relations with Russia. I am very happy that I invite Modi to the next Vladivostok forum as the Chief Guest once again. Agreement in the energy sector. Cooperation in the nuclear field. S-400 missile system is used in Syria, a modernized variant of the S-300. This system from the ground-to-air system will eliminate the fighter ships, missiles, and drones in enemy countries. Russia has used this system to Syria. Air Defense Systems will eliminate the missiles and fifth generation fighter planes within 400 kilometers. The defense system will work as a missile shield in a way. It will protect India from Pakistan and China's nuclear-capable ballistic missiles. This system can also crash America's most advanced fighter jet F-35. This system can destroy 36 nuclear-capable missiles together. If the deal happens then India will be the second country to buy this system after China.